If you have enjoyed my offerings this past year including classes or newsletters, please let me know via an email testimonial or suggest new ways to improve my offerings. If your company is interested in an on-site program, please inquire for details. Better Day Yoga LLC offers On-Site Corporate programs like Yoga, Meditation/Breathwork, and “At-the-desk” classes to fit your budget and benefit the physical and mental health of your employees. Let’s talk about the many benefits to both the employer and employee that Corporate On-Site Programs offer. In response to reader feedback, as well as my own “New Years Intention” to spend less time glued to the computer, I am shortening the format by eliminating the “Featured Deck and Quote” section, and changing the timing of my newsletter to every two months versus every month. If I have something important to relay to you, I’ll send a dedicated email vs. a full newsletter, if need be, on the off months. I will continue to stock and sell one of my absolute favorite decks from local artist, Suzanne Vadnais Monson on my product page! I hope you’ve enjoyed these highlights for the past two years and found them useful! Thanks for your continued interest! ~ Jefferson Smith quoting his dad in the movie, Mr. Smith Goes to Washington, as played by Jimmy Stewart. I love this month’s yoga quote. First off, I simply adore Jimmy Stewart. I always have. I know I’m not the only one. I also love that this is a quote Jimmy’s character remembers from his dad. I think each of us has some words of wisdom or piece of advice given to us by someone special that brings us strength when we recall it. The favorite one from my dad is similar to one YOU might recall Winston Churchill having said. “Never, never, never give up.” I think my dad said to never, never, never quit. I’m sure my dad didn’t know this was a famous quote from Winston Churchill when he shared it with me. I mean, Winston Churchill doesn’t have the corner on telling someone not to give up, right? This quote from my father has carried me through many trying times and continues to be a source of comfort and willpower. Jimmy Stewart’s quote is a unique reminder to appreciate and celebrate life—each and every precious, moment. Sometimes the stress in our lives makes us feel like we are in a tunnel, unable to see anything but the darkness of the moment. By adopting a view of life as if you have always just come out of a tunnel, you learn to have what many Zen meditation books refer to as “beginner’s mind”. Beginner’s mind means you have no preconceived notions about what you are experiencing. It’s all fresh and new. Every day and everything in it is a new experience waiting to be enjoyed. If we had no preconceived notions about how things “should” be, we’d simply let things “be”. There would be no comparisons to an idealized perfection. Remember it’s our thoughts that dictate our reaction to a situation—good or bad. “It is what it is.” It is neither good nor bad. Adopting this attitude gives you a better chance to take on anything in your life. If you don’t label it as a stressor, maybe, just maybe, it won’t stress you. You can view the light at the end of the tunnel in two ways: as a reminder that “this too shall pass”, or as a possible oncoming train. Only you can decide. With a beginner’s mind, you have many possibilities available to you on your journey in life. You are not your age, your job title, your physique, or your possessions. When you are not defined by those things, you can be or do whatever you decide. When you don’t label yourself as good or bad, better or worse, too this or too that, you have unlimited potential. When you appreciate all of it, you have unlimited joy. I’d read a story once about a mother who’d gone through tough times. She was out of a job, and had no money to pay rent. Rather than view her life as being in turmoil, she viewed it as having full potential because she was free—totally free—to do whatever she wanted to do. She shared a proud parent moment later in the book when her young adult son experienced several setbacks at once and announced his sudden realization that he, too, was “totally free!” What a gift she gave her son, and what a lesson to share in her book. Perhaps it’s the time of year that invites seeing your “ordinary” life with fresh eyes. It’s a clean slate and a “do over” opportunity as we start a new year. Just as you don’t need Christmas or the holiday season to create the magic that always resides within, deep down you don’t need a date on a calendar to clean your slate or declare a “do over”! We are all always “totally free” to do whatever we want to in our lives. Sometimes it takes hard times to realize it. Why not realize it regardless of life circumstance? If this time of year gives you a “clean slate” feeling, why not take advantage of that impetus? Accomplishment is fostered by the feelings and beliefs you hold inside. So run with it! With beginner’s mind, your mantra is always “begin again!” No matter what life hands you, begin again! I think I will…Happy New Year! Alignment Cues: Lie on your back, palms down on either side of the glutes. Knees bent, soles of the feet to the floor. Fingers should just touch the heels or be close to it. Keeping the top of the head pressing gently into the floor to protect the cervical spine, and the nose toward the ceiling, lift the hips. Another arm position that gives more power to your lift uses bent elbows with palms facing in. For a greater challenge: Externally rotate the shoulders as you walk them inward and interlace the fingers underneath your body. Your body should be resting on the outside edges of the shoulders. Stack knees over ankles and slide shoulders gently away from ears. Keep your nose to the ceiling, the head centered and still. Engage inner thighs to keep knees stacked and over ankles. Toes in, heels out. This increases the lift providing even more safety for your cervical spine and more stimulation of the thyroid and thymus glands. Variation: One legged Bridge / Eka Pada Setu Bandha Sarvangasana: Exhale and lift right knee in toward chest. Inhale and extend the right leg to the sky, perpendicular to the floor. Release on an exhalation. Repeat other side. Add a prop: If you have difficulty holding the pose, add a block or bolster underneath the sacrum to support you. You can also add a prop between the thighs to engage inner thighs inward spiral and build inner thigh strength. This use of a block also is very grounding, activating your root chakra. Contraindicated for those with neck injuries. Bridge the wisdom gained from past experience with an openness to learn something new. Moments of effort accumulate, creating new paths for energy to flow.” Setu Bandha Sarvangasana / Bridge Pose card from Yoga Path Cards by Susan Woldman. A HeartMath Tip: Take five minutes several times a day, whether or not you’re feeling especially stressed, to try these simple steps adapted from the HeartMath Attitude Breathing® tool. • Focus on your heart as you breathe in. • Concentrate on a positive feeling or attitude as you breathe out. • Lock in this new feeling as you continue to breathe it in and out through your heart. • As you become adept at using this HeartMath tool, select new feelings and to help you “de-stress” as needed. The yoga pose I highlighted when this section first appeared in my January 2012 newsletter was on bridge pose which stimulates the heart chakra. January is a time of new beginnings as we listen to our heart. February focuses on Valentines day with a different “heart” focus. We look at the past year and asses where we’ve been and decide where we want to go. Our “resolutions” may or may not get us there, but it’s in our effort to shine our best selves forward that we create “new paths for energy to flow”. Shining our best selves forward is heart chakra territory. When you “put your heart into it”, and head and heart are aligned, nothing can stop you. A strong heart chakra will fuel your success. Whether you are reassessing your resolutions, or better still, your intentions, your heart knows what you need. Connecting to your “heart’s desire” becomes more important as we journey through life. If you aren’t taking time to shine, you are merely existing. “It is better to be happy for a moment and be burned up with beauty than to live a long time and be bored all the while.” ~ Archy and Mehitabel, by Don Marquis. A strong heart chakra means we are able to freely give and receive love. The more heart-to-heart connections you have, the brighter your world! What makes your heart sing? Love yourself enough to find out what that is. The world is waiting for it. If you already know, great! Do more of that! If you can’t right now, for whatever reason, use your heart’s desire to support you until you can. Set a date and time when you will dedicate yourself to your heart’s desire, even if it’s only for a few minutes. Then look forward to it whenever you can. Looking forward to something—anything—that makes you smile will bring joy to all of your moments. Don’t worry if you are still discovering what makes your heart sing! That’s life! It’s all about discovering “your sense of personal significance”! “Vision emerges from goals, and these goals change, especially if you are in the midst of a transition. The clearer you can be about what you want, even if it changes a million times, and the less you leave to stumbling along with chance, the more fulfilled you are likely to become. Your brain likes it better that way and cooperates much more. “You don’t even have to know what you want. I’ll take care of that. “Your goal is to LIVE YOUR DAY 5 TIMES AS POSITIVE AS IT IS NEGATIVE. That unleashes the genius in you and you begin to discover the zone of the ‘super you’. You dream of it. Why not do it? Now there’s a thought. “Spend as little time as possible correcting weaknesses.” Isn’t that a relief?! What if we all quit focusing on our weaknesses, and only focused on what makes us happy—on our good? I think we are all way to good at beating ourselves up, aren’t we? Let’s stop the madness! Our heart chakra grows with self-love. Worried that your “heart’s desire” isn’t grand enough? You are the only one who knows what makes you smile. So don’t negate the small things, like reading a book, hugging a loved one, taking a nap, or enjoying a few minutes with your favorite hot chocolate drink. Our heart’s desire doesn’t have to be defined by someone else’s definition of grandeur. It’s while you are enjoying the small things, that you discover other joys. It is in your happiest moments that you let life in. Let life in through small joys, and those small joys will multiply. It’s in the accumulation of small joys that life becomes a joy. Remember? Live your days five times as positive as it is negative! What you focus on expands. Energy follows thought. Make it heart-felt energy. What do you believe you can’t do? Have others done it? “Realize that you have it in you to be as great as they. Realize that all that they did, all that they learned, all the skilled they acquired is stored safely away in Universal Mind and that through your subconscious mind you already have access to it.” Secret of the Ages, by Robert Collier. A quick and easy-to-learn way to add ease to your life is by practicing the Inner-Ease™ Technique. It takes only a short amount of time. If you are stressed, acknowledge your feelings as soon as you sense that you are out of sync or engaged in common stressors such as feelings of frustration, impatience, anxiety, overload, anger, being judgmental, mental gridlock, etc. Breathe a little slower than you normally would. Imagine you are breathing through your heart or chest area. This has been shown to help create coherent wave patterns in your heart rhythm and help establish balance and calm in your mental and emotional nature while activating the affirming power of your heart. During Heart-Focused Breathing, imagine with each breath that you are drawing in a feeling of inner ease and infusing your mental and emotional nature with balance and self-care from your heart. When stressful feelings have calmed, affirm with a heartfelt commitment that you want to anchor and maintain a state of ease as you re-engage in your projects, challenges or daily interactions. † From The State of Ease, by Doc Childre. I am loved, loving, and loveable. Air vegetables (the heart chakra is associated with the “air” element): broccoli, cauliflower, cabbage, celery, squash, etc. Geranium, Jasmine, Lavender, Orange, Rose, Sandalwood, Tangerine, Ylang Ylang, among others. Green aventurine, Bloodstone, Verdelite, Jade, Emerald, Moss Agate, Rose Quartz, Watermelon Tourmaline, Pink Tourmaline, Pink Calcite, Rhodochrosite, among others. If gem therapy interests you, I highly recommend www.crystallinelight.com! All yoga poses essentially activate the chakras. Some yoga poses to stimulate the heart chakra include: Bridge pose (highlighted above), passive backbends as when we arch gently over a bolster, yoga mudra arms, fish pose, camel pose, among others. The following section did not appear in this Chakrascope when it was first published. I’m expanding upon my past Charkascopes as well as creating new ones going forward! The term “dosha” comes from the sister science to yoga, Ayurveda. Ayurveda means the science of life. Some say the science of self-healing. Your dosha, or Ayurvedic body type, is associated with the elements—air, ether, fire, water, earth. Those elements combine to create three different doshas/body types. We all are made up of varying quantities of these three doshas. Most of us have a dominant dosha with another one that’s secondary and a bit of the third. The three doshas are Vata, Pitta, and Kapha. From either and air comes Vata, from fire and water comes Pitta, and from water and earth comes Kapha. Vata is associated with characteristics such as “dry, cold, rough, light, mobile/moving, irregular, sensitive, imaginative, spontaneous, resilient, talkative, and expansive/infectiously happy.” Pitta is associated with “hot, sharp, intense, impatient, intellectual, confident, outspoken/brave, ambitious, combative, jealous, spreading/fluid. Kapha is associated with “calm, wet, heavy, slow, dull, static, enduring, sympathetic, relaxed, forgiving, loving, stable, dense”. Knowing your particular body type/constitution empowers you to know literally “what you’re made of”—what makes you tick. You know your dominant characteristics. Getting curious about what’s going on inside your body is my main theme in my yoga classes. Why not make it the main theme in your whole life? Once you know your dominant constitution, you can make choices in your lifestyle to stay in balance, to become whole. Wholeness means healing. Becoming whole means you are giving your body what it needs. You’ll know immediately what throws you off and what centers you. You can use this knowledge to get to know yourself better, to get to know yourself deeper. Looking at the characteristics associated with each dosha, keep in mind that your personal “rain barrel” is already filled with those characteristics so adding more of the same into your life will take you off balance. Your rain barrel will overflow. Adding the opposite characteristics into your daily regimen will keep you centered. So if you’re a Vata, like me, you know that warmth, moisture and ritual/routine in all forms (be it food, clothing, or environment) will be soothing to this cold, dry, mobile body. Get the idea? Just as the heart chakra deals with compassion, the sensitive Vata responds well to compassionate natures. Surround yourself with friends who leave you feeling better vs. drained and activities that correspond to your heart’s desire as we talked about earlier. Vata governs all movement in our bodies such as blood flow and circulation, another deep connection to the heart. As mentioned earlier, Vatas respond well to warm, moist foods and as well as ritual and routine. So planning is helpful! Routines and rituals help to ease stress. Probably Vata’s most important function is that it governs the nervous system. We all know what stress can do the heart. One of the signs of an imbalanced Vata is anxiety which can be caused by too much chaos, too much movement. Instilling slow, grounding rituals like yoga, breath practices (like the one above) and meditation will go a long way toward soothing Vata and balancing your heart chakra. Want more of this? Stay-tuned for my next Chakrascope! Want to know YOUR dosha and start to use the power of your dosha to gain health and vitality? Check out my YogaLean 12-Week Transformation Workshop! We reference the doshas throughout the 12 weeks and empower you to create wholeness by befriending your body. Here are some links to various quizzes to determine your own body type: The Chopra Center, Dr. Oz, the Ayurvedic Institute, and Banyan Botanicals are just a few that are on the web. Enjoy! Music improves your brain. Music — of any kind — fires neurons in the brain that in turn boost memory and mental powers. Got kids? Take them to concerts. They’ll do better in reading and math. Slow tunes lower blood pressure. To dial down high blood pressure, spend 30 minutes a day breathing along to the beat of slow, soothing numbers (think Norah Jones or Frank Sinatra, not Lady Gaga or Ice Cube). Music keeps your ears young. Older musicians don’t experience typical aging in the part of the brain (the auditory cortex) that often leads to hearing troubles. But you don’t have to be Bono to benefit. It’s never too late to start taking, oh, guitar or piano lessons and preventing age-related auditory changes. How reliable are your ears? Music relieves stress. Listening to music lowered heart rates by as much as 5 beats per minute in critically ill hospital patients hooked up to breathing machines — enough of a drop to significantly ease anxiety and help them heal. A good beat keeps you moving. Pick motivating music for your workout and you’re likely to exercise harder and longer, bolster heart health, and lose more body fat. “Pasta e fagioli or pasta fagioli, (or fagiolo) meaning “pasta and beans”, is a traditional meatless Italian dish. Like many other Italian favorites including pizza and polenta, the dish started as a peasant dish, due to being composed of inexpensive ingredients. Today it can be widely found, even in restaurants that do not specialize in Italian cuisine. It is often pronounced pasta fazool in the United States. Sauté celery, onions and carrots in Olive oil in large saucepan for 3-4 minutes until they start to get soft. Add garlic, Italian seasoning and red beeper flakes and sauté over medium heat for 1-2 minutes. Be careful to watch so that garlic does not burn. Sautéing the seasoning will help to enhance the flavor. Add the chicken stock and water and bring to a boil. Turn down heat and simmer for 10 minutes to cook the vegetables. Add the beans, canned tomatoes and macaroni and bring to a boil. Cover the pot and cook for 8 minutes. Add salt and pepper if necessary. Add a sald and you have a hearty, healthy winter meal! The PBS documentary equated what Billy has done to say that it was like re-learning to perfectly speak the English language backwards. Having seen his performances both before and after, and having watched the PBS documentary as well as his Coming Back Alive DVD, I can only say that I am in total awe of the genius, talent, and perseverance of this man. So I offer this highlight as an inspiration for those of us struggling to overcome and conquer in 2012. The PBS documentary said that for a musical talent like Billy, music was his identity, which is why one of his comeback songs is entitled, Dont know how to die and his comeback DVD is titled Coming Back Alive. Billys remarkable left handed return to the stage. This long awaited new recording from Billy’s recent comeback performance features chamber orchestra arrangements by Eugenio Toussaint that envelope Billy’s signature acoustic guitar compositions. You’ve never heard anything quite like this! 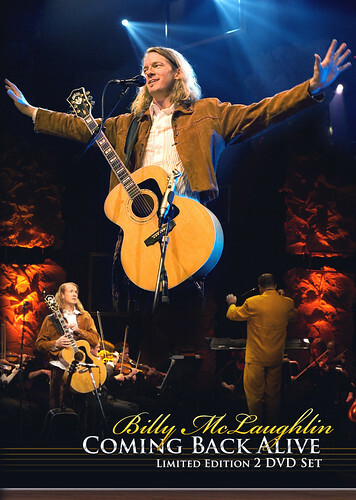 Billy’s comeback concert featuring string orchestra and The Entire Band. 99-minute single DVD concert video directed by David Taylor. FlipSide a documentary about Billy’s struggle with dystonia and features concert footage from Coming Back Alive, scenes from Changing Keys and new interview footage shot in-studio. My second in the series of “Cosmic Numerology” articles for Yogamint has been published! Catch me exhibiting at the Maria Shaw’s Winter Fun Fair! Want to have me work one-on-one with you on correct alignment? Maybe you have questions you want to ask but can’t during class time? A private physical assessment will help me to recommend particular yoga poses for your body after we discuss your questions and history. Feel better about your practice! Do you need a home base to provide your holistic health service to the community? Do you have a passion for health & wellness? Vita Bella Health & Wellness Center offers beautifully decorated, fully furnished common areas, ample free parking, easy on/easy off highway access in a quiet, Little Canada neighborhood. Ideal for acupuncturist, ayurvedic practitioner, chiropractor, massage therapist, etc. Come meet your future colleagues and start or expand your holistic health career today! Serious inquiries only, please contact Sandy at 612 708 6900 or Kari at 763-785-4600.